From Mt. 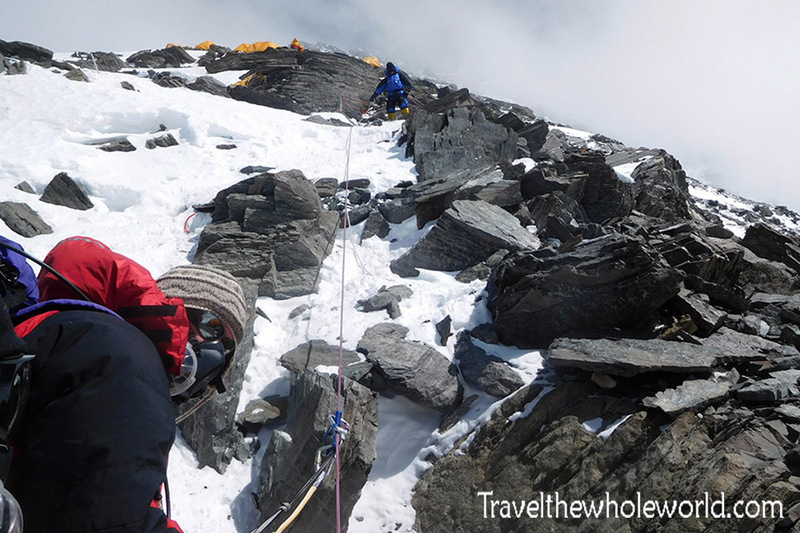 Everest’s Tibet Base Camp to Advanced Base Camp, the journey so far was nothing but hiking. Directly from ABC however, we could see the North Col looming in front of us. This was when we transitioned from hiking in the valley to actually climbing on Mt. Everest. From ABC with my zoom lens I could even make out climbers going up the wall as they head to 23,000 feet (7,000 meters). This next photo was taken from the top of the North Col after the climb was finished. I’m posting it now so you can see the flat snowfield you have to cross after leaving ABC to get to the bottom of the North Col. It’s hard to tell in the photo, but you can almost see ABC near the left center of the picture. From here there is about an hour hike through some rocky terrain, then another hour hike through the snowfield. 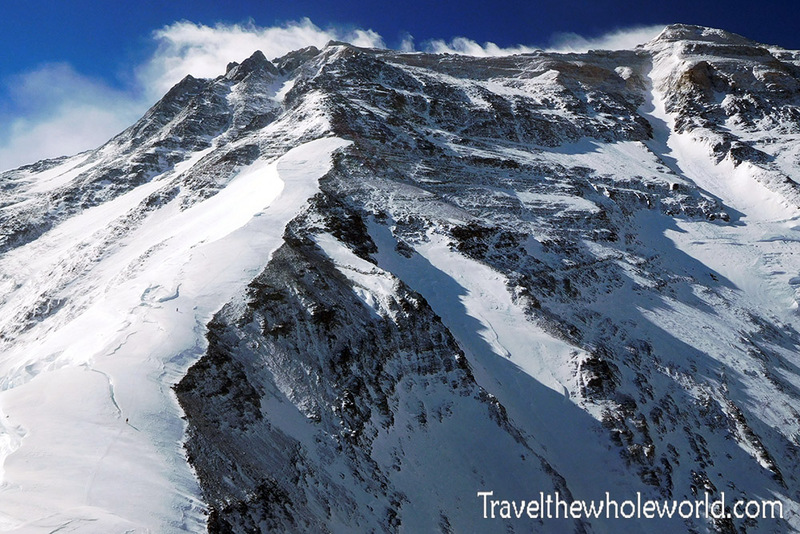 The bottom of the North Col is at 22,000 feet (6,700 meters). The crampon point is before you cross the snowfield, so at the bottom of the North Col we were already geared up. It’s still a good place to stop for a final break and most leave their trekking poles behind here. 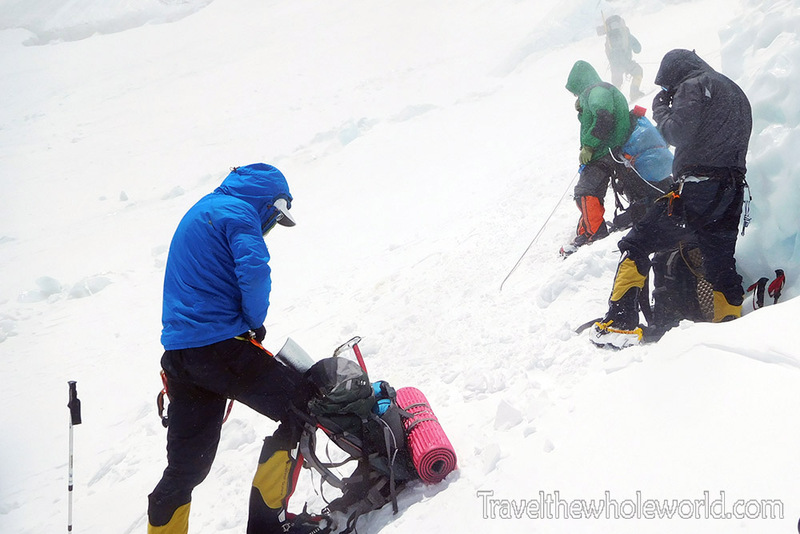 We went up the North Col multiple times to acclimatize, drop off gear, and of course on the final push. 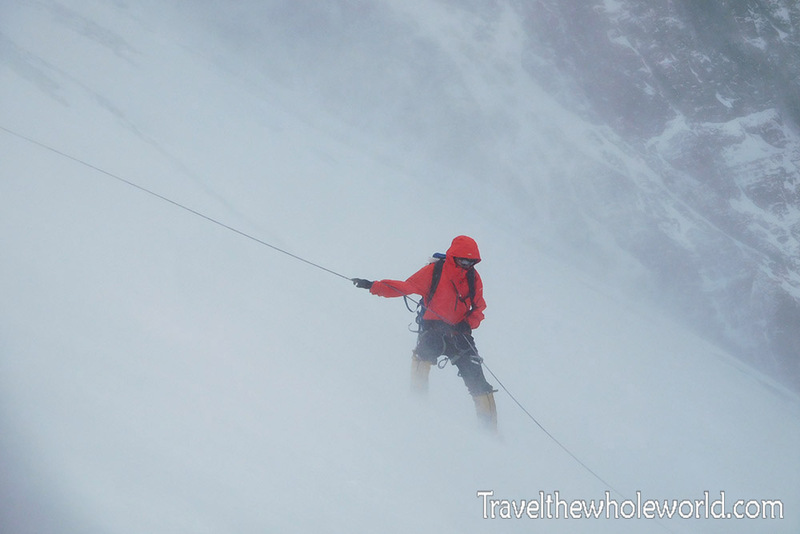 Every time there were high winds at the snowfield which dropped off once we started climbing. Above is my team preparing to start the climb up Mt. Everest for the first time on this expedition. One of the times we went up the North Col we had some serious winds. It wasn’t even snowing outside but all the winds blew it around so it almost looked like we were in a snow storm. 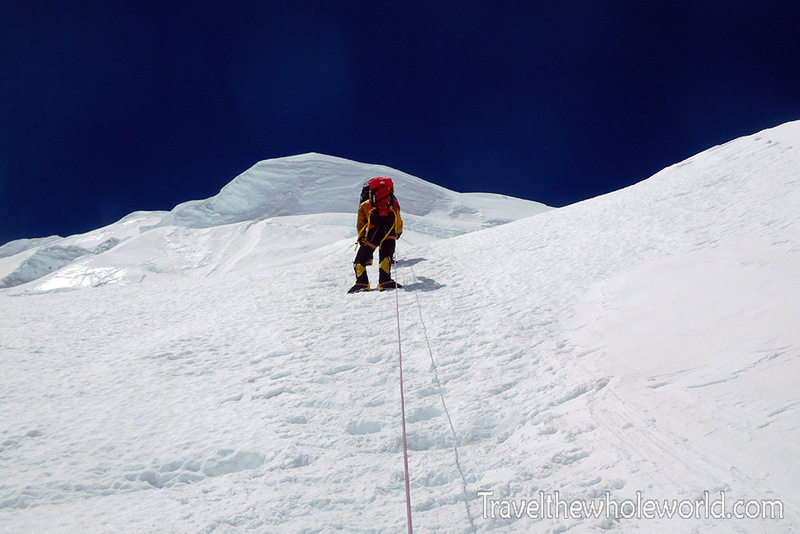 Above is a photo of someone descending the North Col while I passed him going up. Below is a photo of a friend I made from my expedition who was climbing ahead of me. After this steep section was a small flat area where we could take water break. The North Col looks extremely intimidating from a distance. Once you’re actually climbing it’s obviously very steep but feels much more doable. The photo above I took halfway up the North Col to show how steep some of the slopes are. It’s a mix of very steep and light sections and isn’t consistent at all. As a matter of fact, I found the very end of the North Col to be the most painful part. Above shows a climber just below the final ridge. It’s hard to believe when you’re actually climbing at this point that there are tents just minutes above you in Camp I. 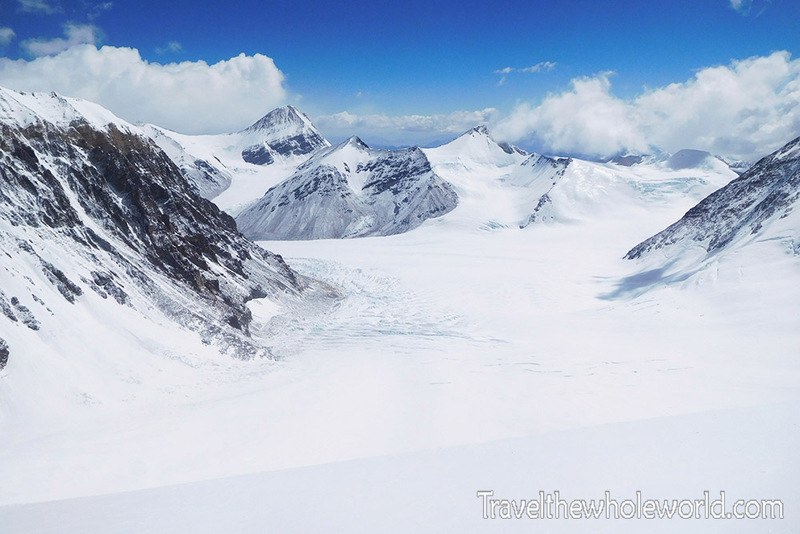 The North Col sits at 23,000 feet (7,000 meters). The first time I came up here I found it difficult to walk because of the lack of oxygen. 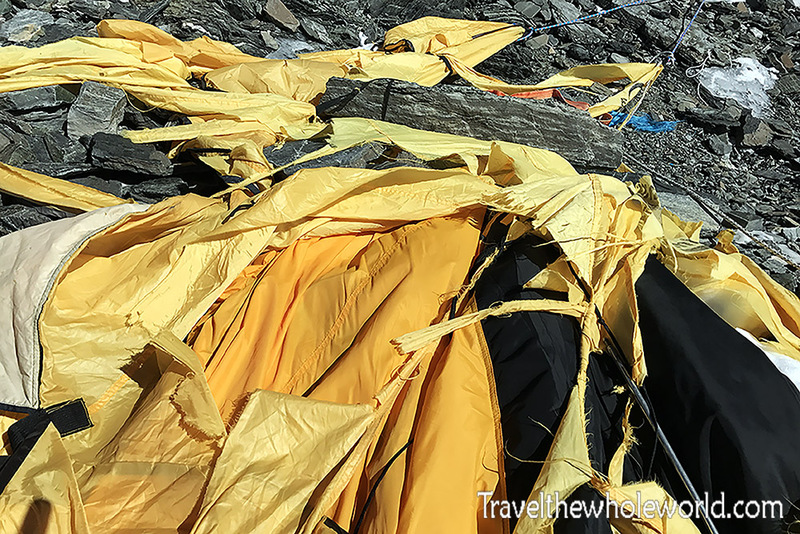 I was horrified to find that these first tents didn’t belong to my expedition and I had to continue walking along the ridge. About ten minutes later I arrived to our camp photographed below. Like the year before, sleeping at this altitude was very difficult. It wasn’t as bad as last year, but regardless I hardly got any sleep that night, maybe an hour at the most without waking up. From the North Col you can get a misleading view of the entire route to the summit. The snow slope you see on the left hand side of the photo is the route up towards Camp II. 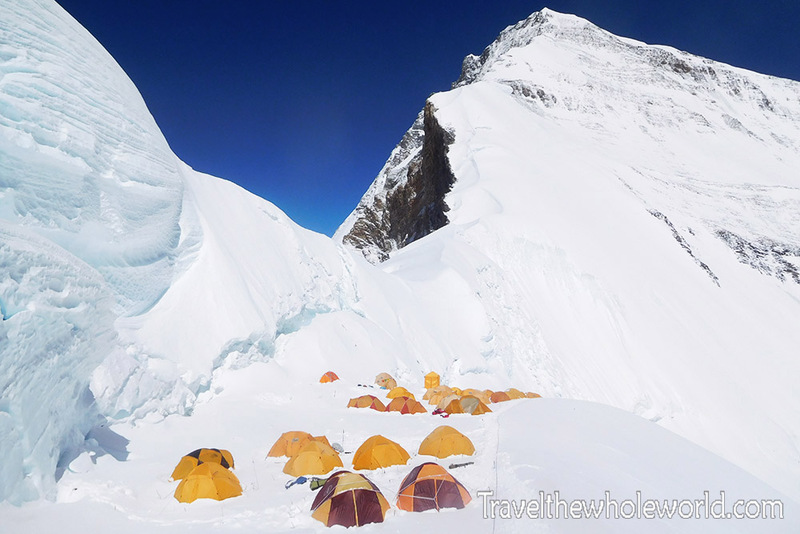 From Camp II which is located at around 25,000 feet (7,500 meters), you do a rock climb up to Camp III below the summit ridge. 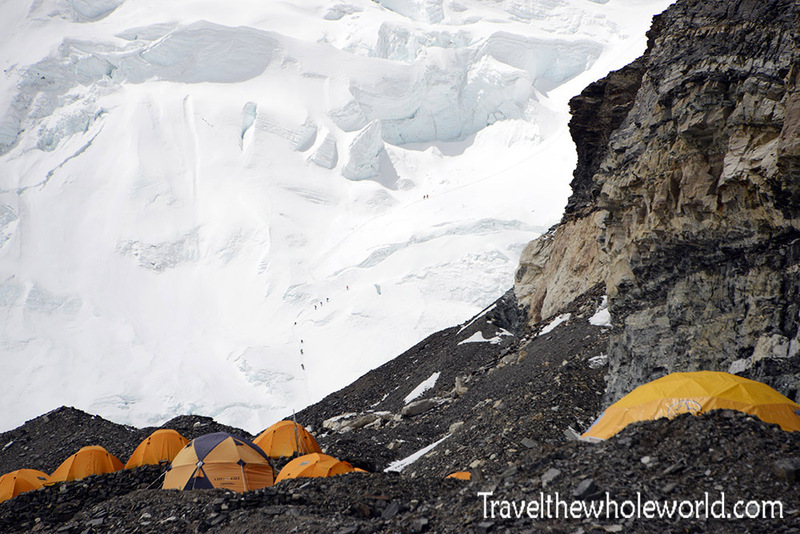 Camp III is the highest camp on the planet, at 27,000 feet (8,300 meters). The view is misleading because it appears that the summit ridge is flat from Camp III to the top of the world. In reality this is probably the steepest part of the entire climb, famous for the three vertical walls or steps as they are called.. I went up the snow slope twice, once without oxygen to acclimatize and again on the summit push. 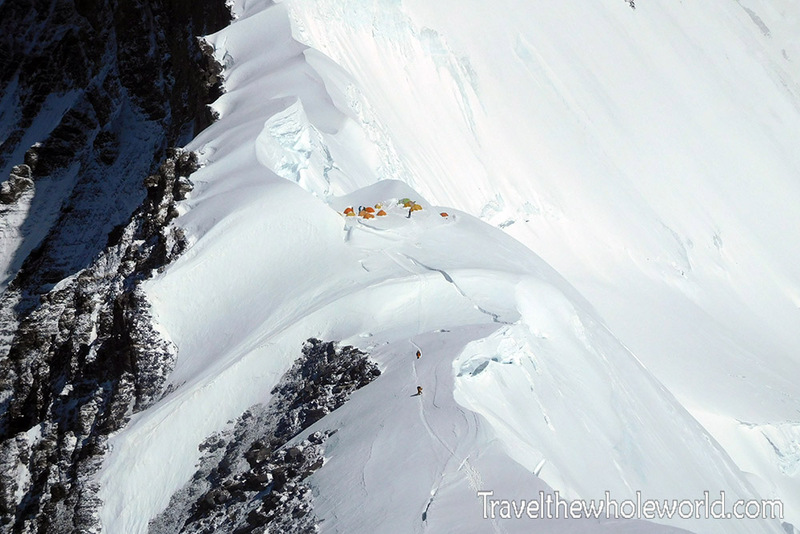 From the snow slope, you can get excellent view of Camp I on the North Col. While in camp it doesn’t appear half as narrow as in the photo above. I met some climbers who had returned to Everest a second time and told me the year before Camp I was even more narrow and exposed. 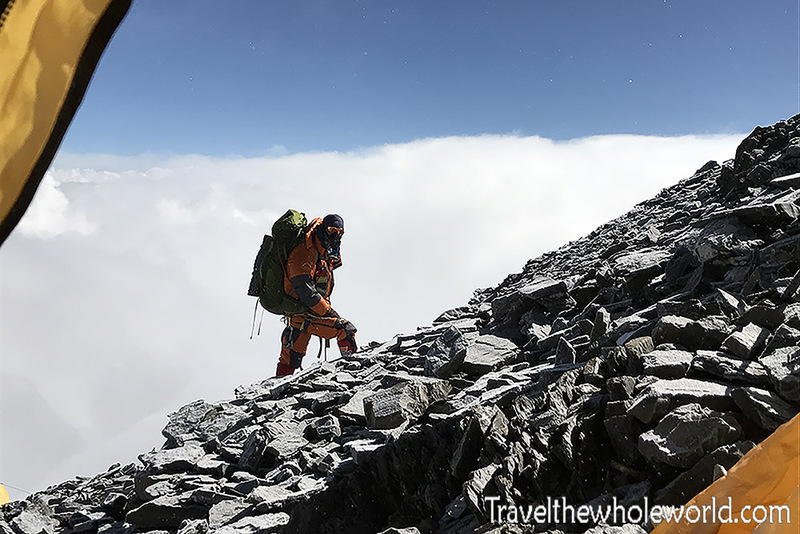 After we slept at the North Col to acclimatize and returned to base camp, it was nearly three weeks before we finally came back for the summit push. We spent another night at the North Col and slept without oxygen, before pushing up the North Ridge to Camp II the next day. The snow slope that you could see in the other photos was absolute torture. After a short time, it seriously looked like we were at the end of it and would be entering the rocky sections. Instead this continued for hours. The snow slope wasn’t hard, but just seemed to never end. Once we left the snow slope we entered the steep rocky ridge photographed above. The rocky section of the ridge wasn’t much steeper than the snow slope. Rarely did you have to use your hands to get past anything, but occasionally it helped to stabilize yourself. Camp II can be anywhere on the ridge after the snow slope. Ours was just about as high as you can have it and located at 25,500 feet (7,850 meters). 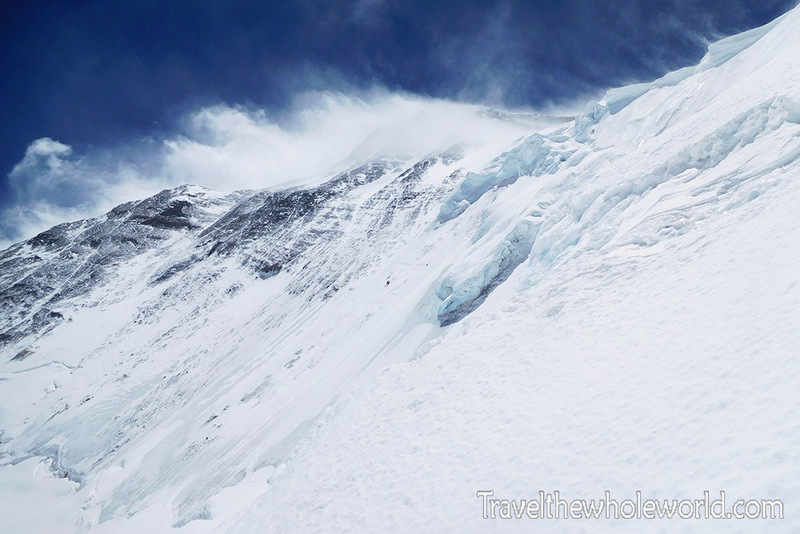 We were just below the death zone and nearly as high as the highest camp on the Nepal side. Once here, we got a report that the weather the next day wouldn’t be good. We decided to stay in Camp II a second night and wait. The photo above I took from my tent as a climber headed up the ridge past my tent. On the second day my friend and climbing partner who I did Carstensz Pyramid with decided to head down the mountain. He wasn’t feeling well and no longer thought it was a good idea to continue to higher altitude. The second night I spent in my tent alone, and woke up to a violent went storm. The video above should speak for itself. I woke up around 5:30am to such violent winds that I thought my tent would be blown off the mountain. When I first opened my eyes the tent was nearly on my chest and I thought I was dreaming. I had to escape by sliding out the door which was completely on the ground, and grabbing what I could. I had left nearly half my gear in the tent and ran into my friends tent. Soon after their tent was too beat up and we had to abandon that too. 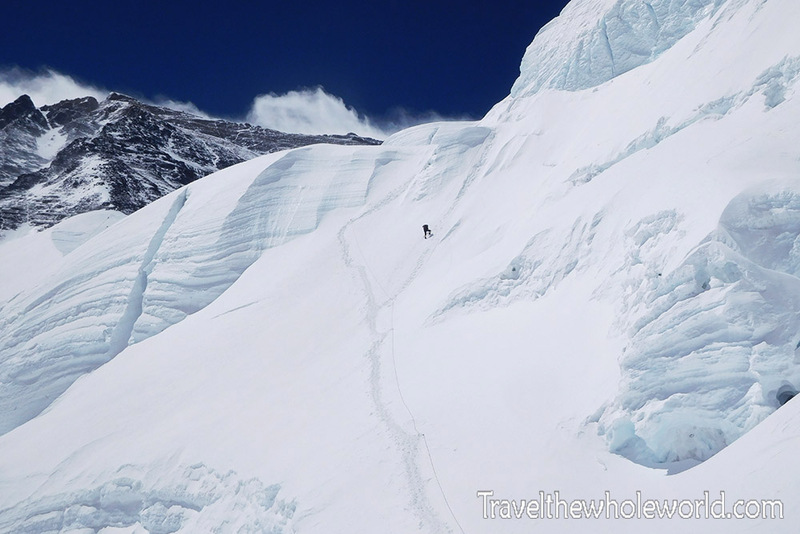 The winds never died down, and around 3pm our expedition leader said we had to abandon the expedition and head down to the North Col. We had lost lots of our gear, our tents were destroyed, and none of us had eaten or drank much that day. I couldn’t believe I had failed to climb Everest two years in a row. We all headed down the North Ridge in the violent weather, and one of our friends who never showed up later had to be rescued. He had severe frostbite, had lost a crampon, and was disoriented. Despite the losses we had, some of us talked about going back up. There was only six of us left from the original dozen that began from day one. It seemed suicide to return up the slope. I had almost no energy left and I couldn’t imagine going all the way back up the ridge and then proceeding even higher to Camp III and then on to the summit. After a rest day in the North Col, five of us decided to return. I felt our chances were hopeless. 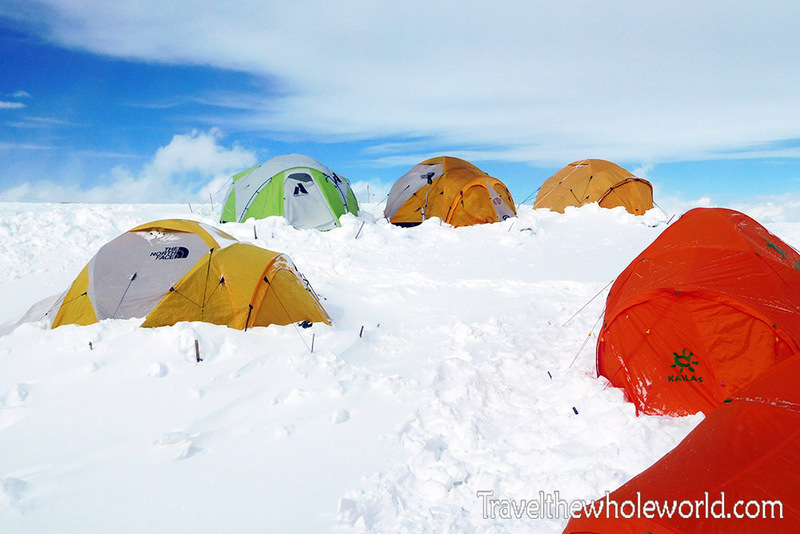 When I left my tent in the North Col I was so exhausted I seriously had trouble standing up. I figured I’d hike up the North Ridge for about an hour and then turn around. Instead, I started to breath oxygen again, ate as much as I possibly could, and each step I took higher the better I felt. It usually doesn’t work that way! Returning to Camp II, we were able to see the destruction left behind from the storm. Above is a picture of my tent only two days later.